One of my private students asked me to make something about flowers, so here it is :-)I enjoyed making this oe and hope she´ll like it, too! 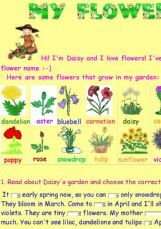 There is a pictionary of flowers, a text for reading and practising Present Simple (mostly), a wonderful easy song and a wordsearch. I´ve made a matching ws to give her as homework. Maybe, it´ll be useful for some of you, too. Have a nice day!